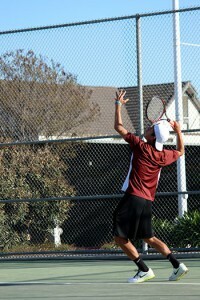 The campus boys varsity tennis team came home with a win defeating Dos Palos 8-1, March 10. The Eagles will travel to Fowler HS tomorrow for their next game beginning at 4 p.m.; come out and support your varsity boys tennis team. For more photos, visit Balance beams and Crunch time. Follow The Feather via Twitter @thefeather, Instagram @thefeatheronline and Facebook @thefeatheronline.